A little over a month ago I gave an overview for Serif’s vector graphics illustrator software, DrawPlus X5. The more research I did, the more I was impressed by how much of a competitor it was to the industry respected Adobe Illustrator for being so much cheaper than its competition. Our readers wanted to know more about this product, and so did I! After contacting Serif I was able to discuss several industry issues with DrawPlus X5 Product Marketing Manager, Simon Monahan, including just how much work into their Accelerated Graphics Technology that makes DrawPlus so quick. Tell us a little bit about your company’s studio(s). Where are you located at? How many employees? What else should our readers know about the people who are responsible for the software they use? Serif is a developer and publisher of creative software for the home, office and classroom. The company was founded in Nottingham (UK) in 1987 by a group of developers that made it their aim to create the first sub-£100 desktop publishing software for the PC. The first version of PagePlus was released in 1990 and the rest, as they say, is history. Over the years, PagePlus has received countless awards and is widely recognized as the number one desktop publisher on the market. Today, Serif employs around 250 people. Our headquarters are still in Nottingham and we have an office in California too. Our range of software has also grown and now includes DrawPlus (for digital art and animation), PhotoPlus (for photo editing), WebPlus (for website creation) and MoviePlus (for editing film footage). Yet our principle still remains the same – to develop feature-rich and easy-to-use software that is affordable. Roughly how many people across the world have purchased or licensed Serif software, and which countries account for most of the sales? Serif has over 6 million customers worldwide. The company’s core markets are the UK and US but in recent years there has been significant growth in other territories too. Our software is now localized in over 10 languages including German, French, Czech, Dutch, Italian, Polish, Russian and Swedish. When was the most recent version of DrawPlus released? 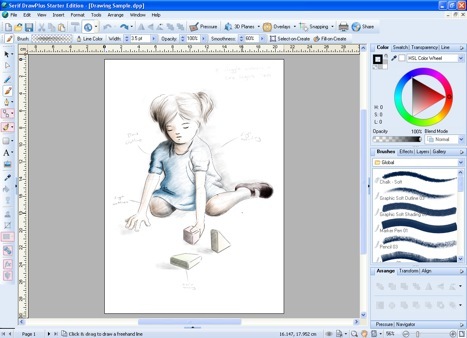 DrawPlus X5 was released in July 2011 and despite the name, it’s actually the twelfth version of the program. What do you think is a current trend in your target market’s industry? How did the most recent version of your software try to focus on this? We know that designers are under increasing pressure to deliver amazing results in less time than ever. The focus of DrawPlus X5 has been improving speed and workflow so that users can achieve professional results in less time than ever. Central to this is the new ‘Accelerated Graphics Technology’ in DrawPlus X5 that powers every aspect of the software for superior performance, accuracy, and color handling. AGT has taken three years to develop and users on a quadcore processor, for instance, are seeing rendering speeds up to three times as fast as the previous version. Other improvements in DrawPlus X5 include end-to-end CMYK document support including full color separation plus new drawing tools designed to save time and offer designers more control. All of the new and improved features in X5 are designed to appeal to professionals and put serious pressure on industry standard applications, like Adobe® Illustrator®, which cost considerably more than DrawPlus. The software is aimed at enthusiast and professional designers but also appeals to novices for its ease of use and versatility. What do you think is the most underrated aspect of your program? DrawPlus is so versatile and I’m not sure it’s recognized enough for this. As well as being able to draw scalable vector graphics, you can paint with realistic brushes, edit and enhance images in the photo lab, extract images from a background, automatically turn bitmap photos into vector artwork, create web graphics and animations, plus much more. Having so much functionality in one application is unprecedented! What do you foresee as the future demands of the market? What’s the next big thing? The software market is constantly evolving. Tablet devices are changing the way users create and view content and there is a big shift towards electronic publishing. The release of Windows 8 is going to be a big milestone too. Exciting times! How does your studio plan on adapting to the future? What features and improvements should users look forward to in your product’s next version, and is there a target release date yet? At Serif we’re very aware of the changes happening in the software industry and have a team dedicated to research and development. We’re hoping that the investments we’re making now will stand the company in good stead for the future. A new version of DrawPlus is currently in planning and unfortunately it’s far too early for me to talk about the new features or a release date. What companies have used this software professionally in the past few years? More and more business are using Serif software for anything from creating marketing materials in PagePlus, to designing logos and graphics in DrawPlus, to publishing websites using WebPlus. Flying Cow Labs are a UK-based design agency and just one example of a business using Serif software on a daily basis. DrawPlus attracts many talented artists too. Griff Wason is a technical illustrator that uses DrawPlus to create artwork for some of the largest companies on the planet. There are many other good examples too. Do any schools or online sites offer classes or training for your software? Serif software is used in approximately one third of schools in the UK and many in the US too. We offer a wide range of educational resources, including videos, which are designed to assist teachers in the delivery of the creative curriculum using Serif software. What section of your online community should beginners check out first? What section will veterans get the most out of? Serif is renowned for offering customers first class help and support. For users that want inspiration or want to learn more, Serif offers a wide variety of written and video tutorials online as well as a dedicated YouTube channel. We also have an active forum at Serif.com that is a really great source of information and users can post comments and suggestions too. User feedback is very important to Serif and the forum is monitored on a regular basis by our dedicated and knowledgeable staff, who interact with our customers and implement customer suggestions when possible. Check-out DrawPlus.com too, it’s a dedicated community for sharing designs with other artists. To get the best results, invest in a good quality graphics tablet that will help you develop your natural drawing style. Posting your work on sites and forums and becoming part of an online community to receive feedback and critique can also be really useful, as well as helping to keep you up to date with the latest trends and techniques. A piece of advice I would give to people that have never used DrawPlus before is to check out our free DrawPlus Starter Edition. It’s a great introduction to the program! Which achievement is your company the most proud of accomplishing? Wow, that’s a difficult one to answer! Personally speaking, one of the most satisfying aspects of the job is helping to breaking down the barriers between professional and consumer software. Serif is helping everyday computer users express their creativity and achieve amazing results. This is a great thing! Are there currently any sales deals available for any of your products? I would recommend you visit our website www.serif.com for our current offers. Downloading DrawPlus Starter Edition is a great starting point, then there are opportunities to upgrade to the full version.